Hey, here's something really stupid and annoying: Facebook abruptly switched everyone's default email address to the @facebook.com account you've never used. Here's how to switch back Facebook's obnoxious overreach right now. Remember long, long ago, when Facebook launched a Facebook email system and then nobody used it? That's fine — it was always just an option you were more than welcome to completely ignore. And we did, because we already had Gmail and work inboxes, and didn't need yet another. If our friends wanted to email us, they could just head to our profiles and have options. Not today! If you go to your profile (or anyone else's), you'll see the @facebook.com email account listed, and none of your others. They've all been hidden in a ham-handed attempt to make the Facebook inbox relevant. Luckily, it's easy to fix this foolish move. Go to your Timeline. Click about, under your contact info. Scroll down to "Contact Info" and hit edit. 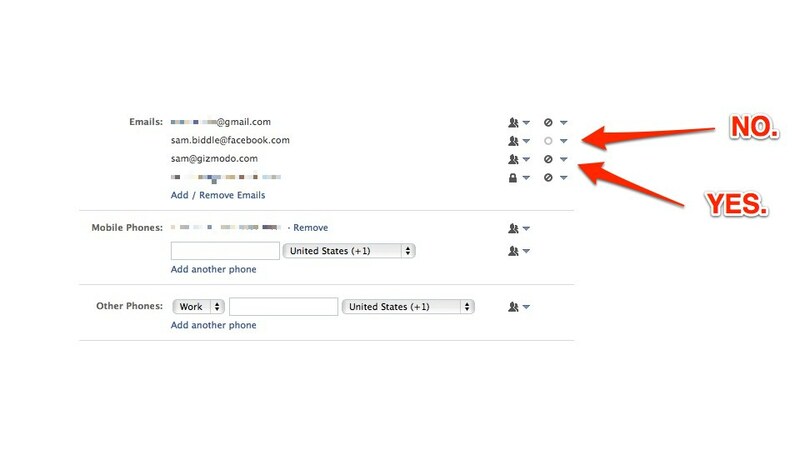 Switch all of the crossed out circle symbols to a full circle for each inbox you want visible on your profile. If you don't want @facebook.com to show up, switch it from a full circle to crossed out. Hit save.